Every year Arai Helmet comes out with a highly coveted limited edition lid for the Isle of Man TT; and each year has a different design, with the latest crop coming from the studio of Aldo Drudi. This year’s design comes on the Arai Corsair-X, a helmet we were very impressed with when we tested it at Thunder Hill last year. As you can see from the photos, Drudi has emblazoned the Corsair-X helmet with the “TT” logo, as well as the island nation’s Triskelion symbol, which is of three running legs. “Ellan Vannin” is of course the native Manx name for the Isle of Man. 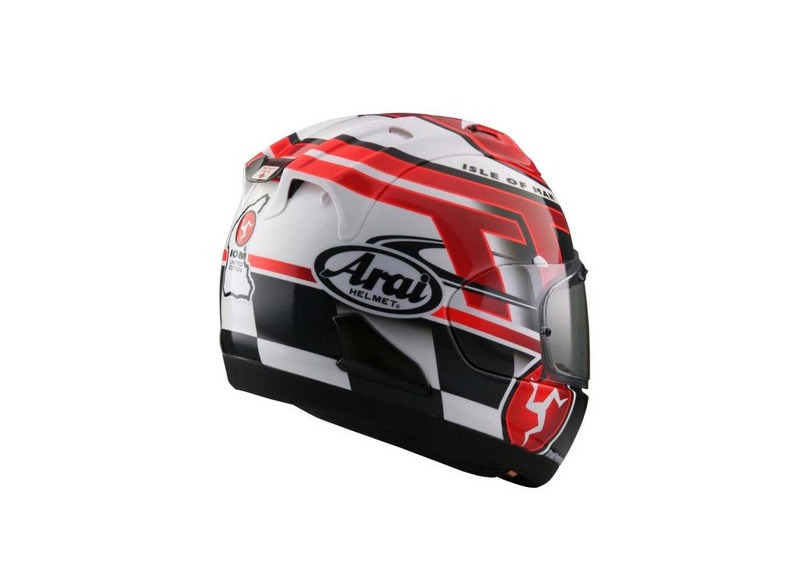 Arai has been a big supporter of the Isle of Man TT, with many riders competing in the iconic road race with the company’s helmets on their heads. Expect to see a few fan favorites sporting the lid at this year’s gathering. Those attending the 2016 Isle of Man TT can pick one up in the grandstand area, and afterwards a limited number of helmets will be available from European dealers. In the USA, it’s a bit tougher to get your hands on a TT helmet, though we suspect a select number of top Arai retailers will have access to them.